(CNN) -- Barcelona duo Thierry Henry and Andres Iniesta continued their respective bids to be fit for the Champions League final as they returned to training on Monday, although not at the same level as their team-mates. 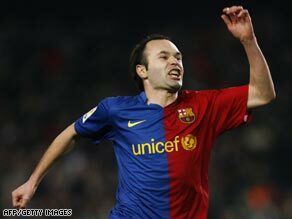 Andres Iniesta looks to be winning his race to be fit for the Champions League final in Rome. The duo are coach Pep Guardiola's big doubts heading into Wednesday's Rome showpiece against Manchester United, but for the first time since suffering their injuries they completed training with the rest of the Barca squad in what was their final session before the Catalan giants depart for Italy. Striker Henry, who has scored 25 goals in all competitions this season, has been sidelined with a knee injury since Barca's 6-2 win at Real Madrid at the beginning of the month, while influential midfielder Iniesta has been out with a thigh problem picked up a week later in the 3-3 draw against Villarreal. Who is the world's best? It remains to be seen if the pair, who trained at a slower pace to their team-mates, will now be fit to face United, but the signs are looking more promising for Guardiola and both will travel with the rest of the Barca squad. Also included in the travelling party are young defenders Alberto Botia and Marc Muniesa, the 17-year-old who was sent off on his Barca debut in Saturday's 1-0 home defeat to Osasuna. Those two will help provide cover for a Barca defense that has lost full-backs Dani Alves and Eric Abidal to suspension, and center-backs Rafael Marquez and Gabriel Milito to injury.